I hope you all had a wonderful weekend. I’m here today to reveal a special extract from a wonderful Aussie author. I’ve been extremely busy over the weekend, so this post is a few days late – for that, I’d just like to apologise to Ermisenda. Thank you for being so patient! Synopsis: “Bloody mistakes, ugly scars, and beautiful lies. A tale of corruption. 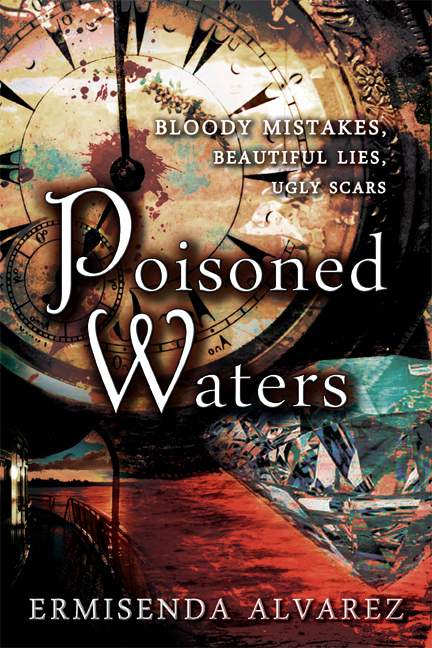 This is the first chapter to, Poisoned Waters. “Ja, alstublieft.” Yes, please. Sylvia responded in Dutch. Hurriedly arranging more servings of caviar, Benjamin heard someone calling his name. The barmen needed an extra and Benjamin begrudgingly agreed, hoping he wouldn’t lose his break. While he was serving wine, spirits, and beer he noticed the mass of people congealing together. Several men were gobbling their appetisers, licking their thick fingers, and grinning with oily lips. Benjamin tried to stay as invisible as possible. He served the customers with a soft voice and shy nods. A man in his forties arrived at the bar demanding two glasses of their finest wine. Without hesitation, Benjamin prepared the drinks, but as he put away the wine bottle it knocked over one of the glasses. The sound of smashing glass pierced Benjamin’s ears and he cringed with the expectation of a beating. The flustered barman came over, prepared the second glass, and took it over to the middle-aged man, who, in the midst of the loud band, hadn’t heard the accident. The German man walked off, leaving no tip, but instead a twisted smirk. Benjamin’s heart fluttered. It wasn’t the middle-aged man who had caught his attention, but the woman he was advancing towards. His eyes lit up, the weight on his heart lessened and fleetingly he smiled. She was beautiful, her snow white skin glistened and honey-gold hair cascaded down her back. He wondered how sweet she would taste. Harold massaged his aching fingers. His British companions shared clever puns over their glasses, chuckling. The occasional spray of saliva was also shared. Harold sipped from his own drink but had not achieved the level of drunkenness his colleagues were currently at. On top of having a high tolerance for alcohol, Harold always seemed to either give up paying for expensive drinks or was unable to stomach much more than a few glasses. The friends spoke in barely coherent babbles of what was once the reputable English language. He had studied with them at the same stuffy university; business had been their chosen area before they all diverged into specific streams. Their current usage of language suggested they hadn’t even completed their high school education. The stench of cigarettes and alcohol was suffocating him. Taking his turn to leave, Harold moved off into a different direction. His old colleagues had barely noticed him leave. The moment he had detached himself from them he felt much more relieved. The loud noise was deafening and rather than degrade his senses he drifted to the doors that would lead him outside. A young waitress with a stony expression took his glass. The doors were opened for him by the young boys who stood by. Harold gave them respectful nods which they returned. The wind bit at his neck and shaven face while tousling his dark blonde hair. His emerald eyes were squinted in protection against the wind. Harold moved out onto the deck of the cruise ship and touched the railing. It was so cold that he retracted as if he had touched something hot. The chilling weather outside was causing him to shiver and shake. Was there a storm coming? He was still young, merely thirty, and yet he was acting and feeling like he was eighty. Wasn’t that the age when you left parties early, lost interest in getting intoxicated, and your muscles ached? Wasn’t eighty the age when you were meant to be widowed? Trying to restrain the burning tears streaking his eyes he looked over the side of the ship. It was difficult to do so, the floor was slippery. He caught a glimpse of the heaving black waters that the boat sailed upon. Harold turned around, resting his sore back against the railing, catching his breath. It was hard to breathe out in this weather and the penetrating winds were only growing stronger. A shadow scattered across his vision. As soon as he raised his gaze, tears leaked from the red rims of his eyes. “Harold,” her familiar voice cooed. “Be gone!” he yelled, shutting his lids tightly. These phantoms that haunted him showed no mercy. They sunk their teeth into his fleshy mind when Harold least expected it. The tender caresses of his wife brushed past his cheek. Harold’s hands aggressively pushed it away, only to encounter nothing but air. Slam! He felt the cool floor smack hard against his tailbone. The floor polished with an icy sheet had been pulled out from under him. The pain that shot through his body expressed itself through miserable groans from his chattering lips. Harold let his body lull; the back of his head hit the ground. His eyes drifted to the brightly spotted sky. Heat from the love made by the couple did little to extinguish the cold that was penetrating Harold’s suit. When Harold raised his hand to the back of his head he felt something warm and sticky. Hushed moans continued to be heard, not far from him. It was hard to see in the darkness. Darkness was encroaching on his vision. Before he had another moment to consider his actions, a shriek pierced the night air. The scream was not one heard in the middle of making love but one that burst through a woman’s lungs in fear and pain. Harold scrambled to his feet, trying to place the location of the scream. He knew it wasn’t from the couple he had been eavesdropping on. The sound came from a different direction. The dark, gloomy deck of the ship tilted dangerously. Harold grasped onto the railing but felt his feet gave way. Harold stumbled toward the location of the scream that had sliced his mind like a knife. The back of his head throbbed. Why couldn’t he hear the sound of footsteps? Why weren’t there lights on? “Help! She needs help!” Harold tried to yell but only managed to whisper. His vision blurred before everything went black. Ermisenda is ‘zealous, morbidly-curious, worldly, logical, a chocolate-fiend and gamer’. She is the author of Blind Sight Through the Eyes of Leocardo Reyes (Blind Sight Book 1), which can be found on Amazon, Barnes and Noble, Goodreads AND Blind Sight Through the Eyes of Aniela Dawson (Blind Sight Book 1), which can be found on Amazon, Barnes and Noble, Smashwords and Goodreads. So how amazing was that?!?! I don’t read a lot of crime but it’s a genre that really intrigues me. I will be getting around to reading this book very soon, when work, my internship and uni balances out a little. If you enjoyed this extract, do go and buy the book! I would love to hear your thoughts on it.